The following has been taken from a previous thread and is a general help thread as for rolling characters. Now, this is the way that I roll my characters. It is the way I find to do easiest. As you go along, you might find a few things you might want to do differently for future characters, and that is fine. Work on your character however you want to. I am also rolling a new character as I type this, I shall provide examples as I go along. (4d6). If you do not have any dice, use www.random.org and set the variables at 1 and 6. Disregard the lowest die roll and total the three highest ones. The result is a number between 3 (horrible) and 18 (tremendous). Make this roll six times, once for each ability (Str, Dex, Con, Int, Wis, Cha). After these rolls I have ended up with the following stats; 17, 17, 16, 14, 10, 7. 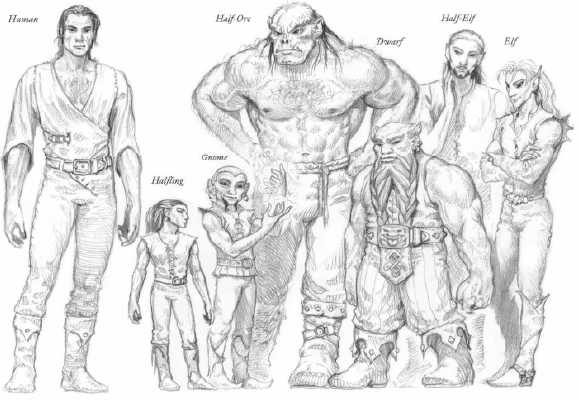 At this time you will want to decide what race and class you are going to play as. I'll give a small description of each. Each race (apart from Humans) have varying ability score modifications (not to be confused with ability modifiers). Humans: No change to ability scores. Extra feat. Half-Elves: Human-Elf hybrid. No change in ability score, don't get the extra feat, gain a few Elf abilities such as immunity to sleep. Beside each I shall list the abilities they rely on the most (which you'll usually want your highest score to be). The first being 9 out of 10 times the most important to that class. Barbarian (Str, Con, Dex, Wis): A ferocious warrior who uses fury and instinct to bring down foes. Bard(Wis, Cha, Dex, Int): A performer whose music works magic—a wanderer, a taleteller, and a jack-of-all trades. Cleric(Wis, Con, Cha): A master of divine magic and a capable warrior as well. Druid(Wis, Dex): One who draws energy from the natural world to cast divine spells and gain strange magical powers. Fighter(Str, Con, Dex): A warrior with exceptional combat capability and unequaled skill with weapons. Monk(Wis, Dex, Str): A martial artist whose unarmed strikes hit fast and hard. A master of exotic powers. Paladin(Cha, Wis, Str): A champion of justice and destroyer of evil, protected and strengthened by an array of divine powers. Ranger(Dex, Str, Wis): A cunning, skilled warrior of the wilderness. Rogue(Dex, Int, Wis): A tricky, skillful scout and spy who wins the battle by stealth rather than brute force. Sorcerer(Cha, Dex, Con): A spellcaster with inborn magical ability. Wizard(Int, Dex, Con): A potent spellcaster schooled in the arcane arts. You'll find more information on the respective pages in your PH. At this point you may enter a few of the formalities of your character sheet. You may give your character a name and a gender. You may add your characters height and weight. You may add your characters eye, hair, and skin colour/tones. You may add the size of your character; "S" for Small for Gnomes and Halflings. "M" for any other race. Do not worry about Alignment or Deity/Religion just yet. There is a list of feats on I think page 90 in your PH. As for your armour, you want to do the same. Here is mine again. If you have a shield, do one for that, too. There is a list of weapons and armour from pages 116 - 123. As for other gear/possession. You can just take that which is listed from your Class listing. With all that nonsense done; it is time to choose your characters' skills. Hey, where are you going? This is important. Just hang in there. We're almost done. 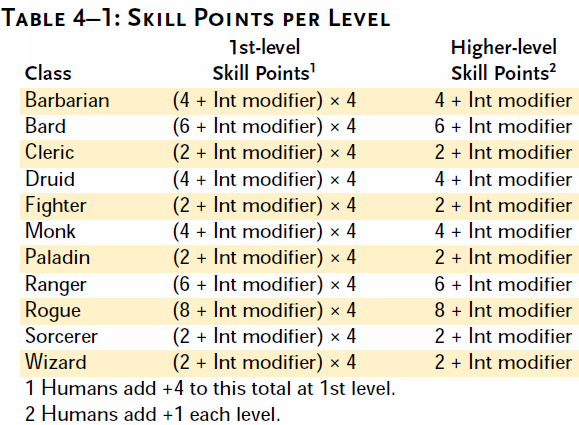 Your character’s class and Intelligence modifier determine how many skill points you have to buy skills. There is a table on page 62 of your PH with your first-level skill points allocation. But here it is for easy reference. Remember that you will always get at least 4 skill points, even if you do have a negative Int modifier. 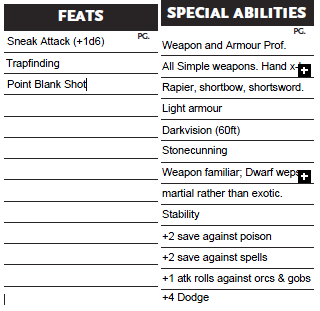 For example, Grafalcon is a 1st-level Dwarf Rogue with an Intelligence score of 14 (+2 Int modifier). At the start of play, he has 40 skill points to spend (8 + 2 = 10, 10 × 4 = 40). At level one; you may have a mamimum of 4 ranks on a class skill. If you were to add ranks to a cross-class skill, you would have to use double the skill points. i.e. A rogue adding 2 ranks to Appraise would use up 2 skill points, while if he tried to add 2 ranks to Handle Animal - which is not one of the Rogue's class skills - it would cost him 4 skill points. Now then. If you are rolling a spellcaster. This would be your time to choose your spells. Different classes gain their spells differently. For example; A Cleric would know of every spell of each caster level he/she has attained. Where as a Wizard can only cast the spells they have learned from scrolls or other magical writings. After that you're pretty much done. Now you can go through filling out everything else that you may not already done. I suppose I'll touch on a few of them. HP = Hit Dice + Constitution modifier. 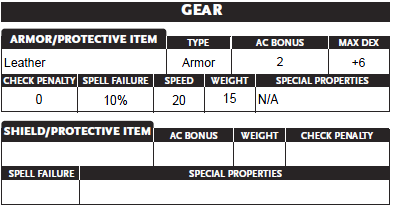 Grafalcon - as a rogue - has a hit dice of 1D6, and a Con modifier of +4. Grafalcon's HP is 10. Fairly simple. Your AC is 10 + your armor bonus + shield bonus + dex bonus + any other applicable bonus. Your Touch AC is 10 + Dex bonus. This AC is 10 + your armor + shield bonuses. Without armor; all Medium size characters move at 30ft. All Small size characers move at 20ft. The only exception to the Medium size rule are Dwarves. But they can move their full movement even when wearing heavy armors. A human wearing leather can move at 30ft. But if said race was wearing anything heavier than a chain shirt would move at 20ft. A halfling in scalemail would only be able to move 15ft. Your Base Attack Bonus is located on the same class table you got your saving throws from. For a lot of classes that aren't combat specialists, this will be 0. That's about it, really. Anything else pretty much automatically changes itself on the interactive character sheet. If you have any other problems or any questions; post 'em up! I rolled for abilities and generating the basic stats but feats etc is going to require some digging. Hopefully done this time tomorrow. All good mate, should be a day or two before I put up the actual Campaign thread. On a side note; if anyone needs help with any aspect of character creation, feel free to ask, and someone (if not myself) is bound to help out. Drav wrote: I rolled for abilities and generating the basic stats but feats etc is going to require some digging. Hopefully done this time tomorrow. May I inquire as to what sort of character you are rolling? Cleric, but it's not too late for me to start over if you'd rather we create characters based on the campaign. The only real restriction is that of a good and/or neutral character. Toementor fucked around with this message on 2015/09/27 at 00:40:54. All times are GMT. The time now is 19:02:01.